Kamela Eaton is a longtime artist and designer with a striking style and an important message. After years of graphic art, illustration, and studio painting, Eaton is opening the doors to her debut solo exhibition “United States of Mind” this Final Friday, March 29th, 5-9pm at the new Cjoy Soulworks gallery at 110 N. St. Francis. I cannot remember a time when I didn't draw pictures; it's like eating to me - sooner or later it must be done. 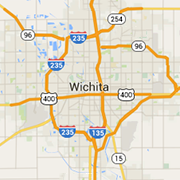 I am a native of Wichita and a product of Wichita Public Schools and the Northeast Community. I received a BFA in Graphic Design from Wichita State University. Over the years I have lived and worked in Atlanta and Sacramento as an illustrator and graphic designer before returning to Wichita 10 years ago. Over the course of several years I have created a series of fugitive paintings that explore all aspects of my identity. In November of last year I was chosen to create a mural for the Horizontes Project. It is located at the northwest corner of 13th Street and Santa Fe in Wichita. All of the great album cover artwork of the 1970’s and my older sisters, Kim and Kandace. Kim, who was a vegetarian/hippie, introduced me to books like “Be here now”, “The Prophet” and “Our bodies, ourselves.” And Kandace, who could draw really well, introduced me to Black literature, art and history. I’ll never forget when we were kids and she drew the Starship Enterprise, Dr. Spock and the cosmos in chalk on our driveway. All of our neighborhood friends, including myself, stood around looking in amazement. I knew then that I wanted to be an artist like her. I have to start with those whose names we’ll never know. They craved, sculpted and painted images of themselves, their gods and animals using stone, wood, and earth. The pre-colonial artists of West Africa. Of course Frida Kahlo, then Rene Magritte, Georgia O’Keeffe, Jean-Michel Basquiat, Bill Traylor, and The Gee’s Bend quilt masters. Currently, Alison Saar, Kerry James Marshall, Simone Leigh, Vanessa German, Daniel Minter, Robert Pruitt, Sarah Ball, and Kara Walker, all blow my mind. I could go on and on… I'm just a fool for art! What do you hope to communicate through your art? With this body of work in particular I would like to share the “states of mind” that I navigate and negotiate while living black, female, queer, working class and clinically depressed in America. I would like to help remove the stigma associated with mental health, not only in my community but nationally. With my art I would also like to confront and encourage open, honest dialogue concerning the “ills” of the United States. Those “ills” include racism, sexism; colonialism; white male supremacy and privilege; cultural appropriation; classism and heterosexism. I believe that these issues must be brought into the light, acknowledged, understood and accounted for before true healing and recovery can begin. Although I may begin a painting with a clear game plan, as the paint is applied and the image takes form, broader themes of social and universal significance emerge. A good portion of my process relies on intuition, trust and a willingness to maintain open to what the painting wants to reveal. What can people expect to see at "United States of Mind"? So, we're not talking a basket of puppies or a gorgeous sunset landscape here. Some may encounter images that they find disturbing or at least confusing, but that's all part of the beauty of experiencing art - to “feel” something. At the end of the day, I hope that the paintings lead to thought, discussion and ultimately change towards a more just and inclusive America. In most of the paintings, I have used gender ambiguous, black (if not in color, in spirit), bodiless heads mixed with iconic objects and subjects from American pop culture, childhood memories, and adult experiences to create a visual vocabulary. The heads play several important roles, on one hand, they represent feelings of detachment, isolation, and disconnection often associated with depression. And as equally important, they represent the African American psyche and others on the margins of society who have been considered and treated as less than whole human beings. Lastly, with the heads, I am referencing my ancestors of West Africa, like the Yoruba of Nigeria, who believed that the human head is the center of character and emotion. My goal is not to capture a likeness of any particular person, but with symbolism and metaphor, translate my personal perspective into a visual language that can be cross-culturally understood and considered. I am particularly interested in the interior spaces within oneself - places in the heart and soul where thoughts, dreams, memories, and beliefs are explored; barriers are dismantled; emotions are unearthed and hopefully, positive change happens. First would be to draw, draw and draw some more! The more you do, the better you will become. Second, expose yourself to and explore all art that you can, not just what you have been told is “classical” art or the “best” or “highest” art forms. Make your own opinions based on what speaks to your heart and soul. Lastly, don't be afraid to try different mediums, techniques, and tools - just get out there and create!